The weather was great: nice cloud cover, mild temp, no wind to speak of, and the sun breaking through between 0930 and 1000. The half marathon course was a series of out and back routes that made their way from and back to the start/finish line area. 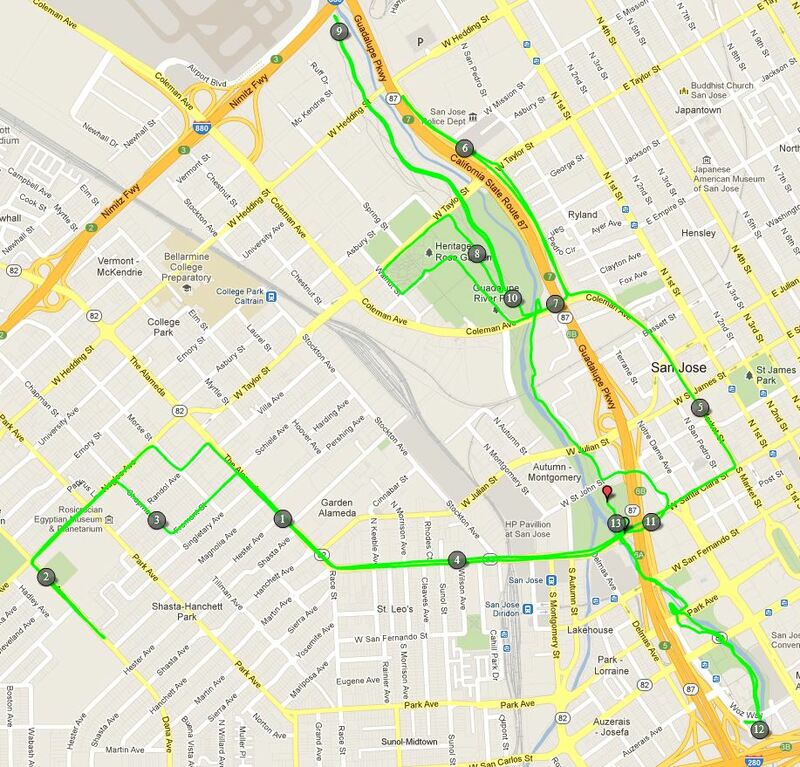 The flat and fast course was split between city streets and the Guadalupe Trail system, which is a paved urban trail. The only “hill” was the Coleman overpass near Route 87 – which really wasn’t a hill at ~20′. Course marking was excellent and there were volunteers everywhere to make sure people stayed on course. While it was OK when I was running, I expect that the course probably got crowded on the Guadalupe Trail portion once the main pack of runners got there – especially on a few portions where runners needed to run on the opposite side of the trail to enable flow. 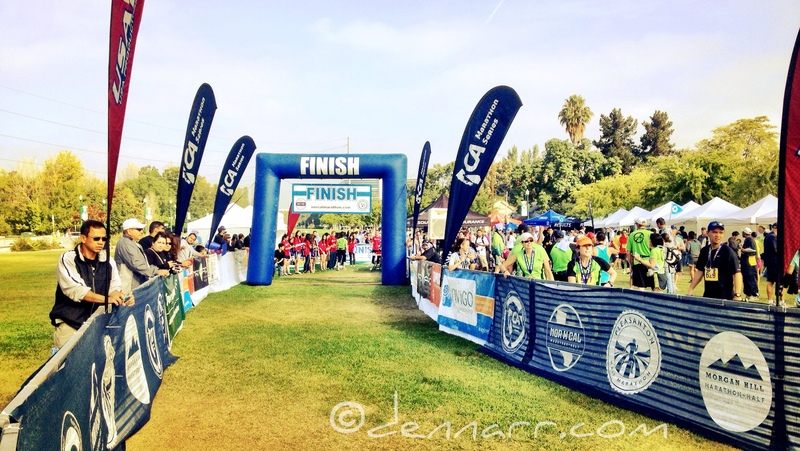 At the finish line, there was some food and drink for runners and a few vendor booths. 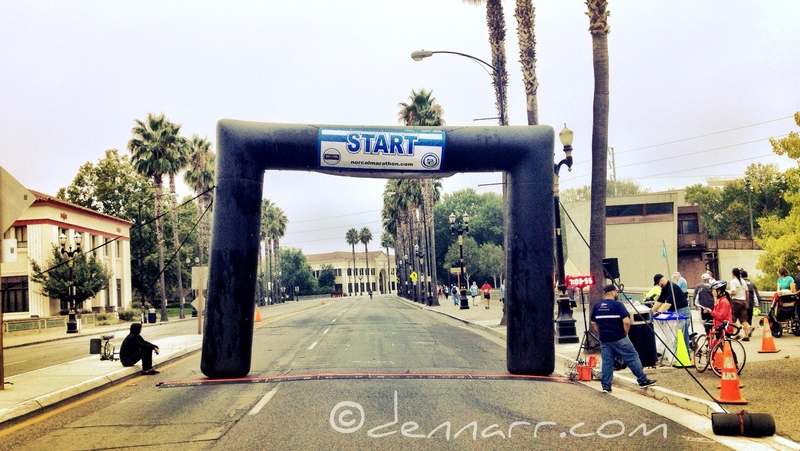 The same group that put on the Pleasanton Half Marathon [my race report] ran this event. It seemed like Pleasanton was more of a draw for vendors and such. All in all though, the NorCall Half was a well-organized race and all I saw were happy runners – which is a wonderful thing. Anyway, I stayed within about 10 yards of the pacer and his group of ~12 for the first 7.5 miles (with splits of 7:57, 7:57, 7:56, 8:03, 8:00, 8:01, & 8:09.) It was around that distance that my body told my mind that I was doing it wrong: “Yo, dude! It’s not heart, personality, head…it the exact opposite!” If you’re a runner, you know that optimal pacing should be negative (high to low) – not the direction I was heading. I regrouped and slowed the pace to probably what the first part of the race should have been paced at – though I was still pounding out a positive split pace for miles 8-12 (splits of 8:17, 8:22, 8:53, 9:03, 9:03.) The damage was done, though I did grit out an 8:27 and 7:21 for miles 13 and the final .1! During my “regroup”, I told myself that it was OK to pull back (it was happening regardless), but that I WAS NOT GOING TO LET THE 1:50 PACE GROUP PASS ME! In the end, that goal was met. After the race, I found the 1:45 pacer and asked how he finished. 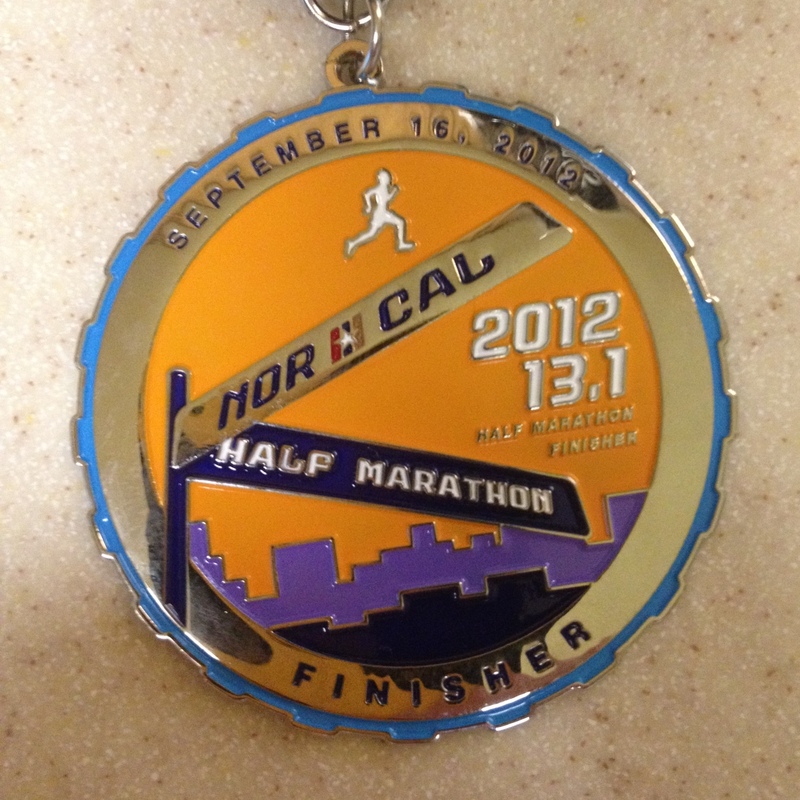 He said right on time and, according to the results page, he actually finished at 1:44:06 – pretty good pacing. He also shared that only one of the original group stayed with him the whole race. 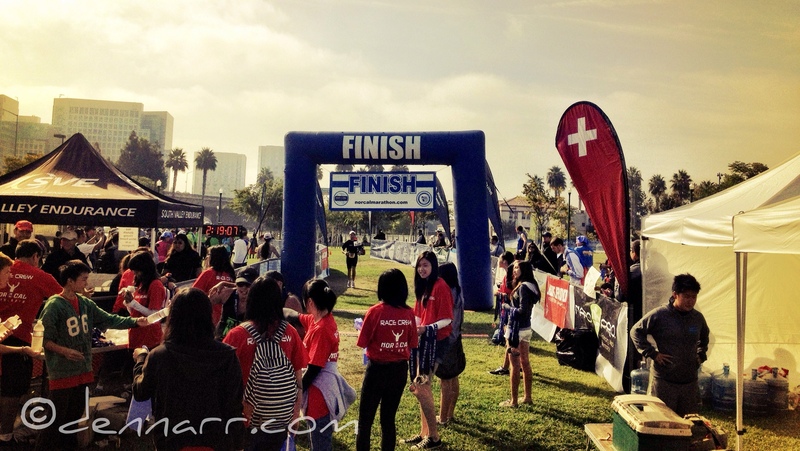 This was my fifth half marathon. 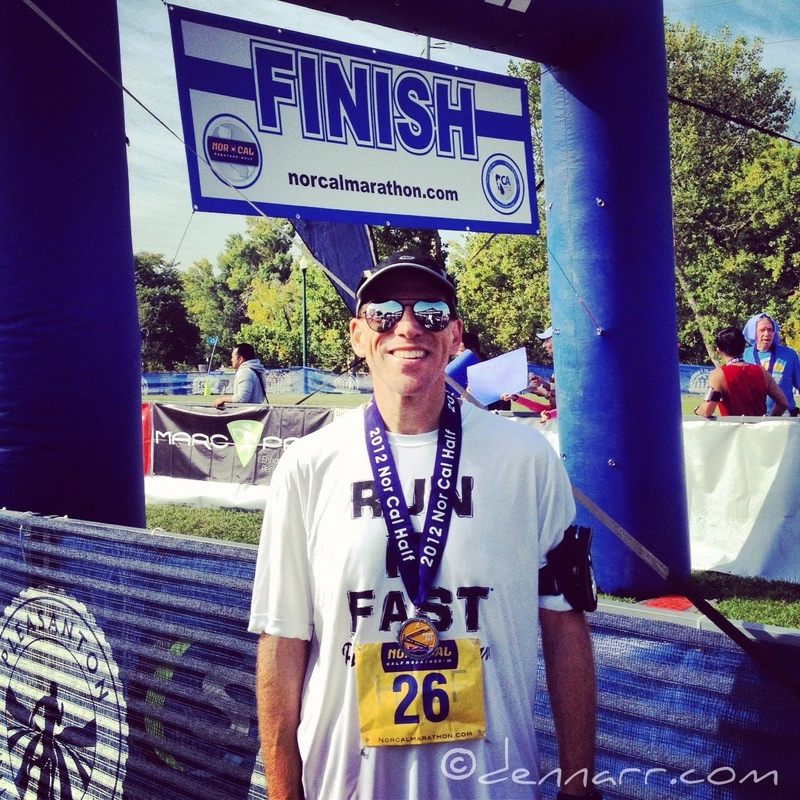 While my time wasn’t a PR, it was my second fastest – I was only off my PR by 53 seconds. I WILL YET CONQUER 1:46:21! Pre-race & race-day fuel: Same as usual – 48-hour carb loading period (at +550 calories/day and at a carb level greater than 80% each day) and 6 GUs and 20oz of GU Brew on race day. Bottom line: I am happy with my race; and, like all of them, it was a learning experience for me. That’s what running is all about anyway, isn’t it? Comments: I did 7.52 @ an 8:37 pace.